This list of sources for lamps and parts is provided as a service to collectors looking for sources for lamp repair and restoration. They are generally suppliers known to Guild members, but inclusion here should not be construed as an endorsement by the International Guild of Lamp Researchers. VITRI-FORMS, Inc. (Brattleboro, VT, USA). This small firm specializes in borosilicate custom glass fabrication, and appear very nice to deal with. They have a $25 minimum order, but item pricing for custom chimneys seems reasonable. I'm sure a stronger recommendation will follow with more personal experience! A & H Enterprises (Tustin, California, USA). Optimus, Primus, Petromax, and Geniol. Specializing in stoves. Associated Kerosene & Oil Lamps (Braidwood, New South Wales, Australia). John & Linda Gannon, sell lamps, and parts for Australian and modern Aladdins, Handi, Austramax, Kayen, Gloria, Tilley, Veritas, and some other obscure makes, plus restoration work. The Base Camp (England). Spares for Tilley, Vapalux/Bialaddin, Petromax + Magnalux, Optimus, Anchor. Wicks. Some obsolete parts. "Mike the Stove" is a GEM! City Hardware (England). Optimus, Primus (stoves only), Tilley. Coleman (Wichita, Kansas, USA). All currently available Coleman products and parts. Offers repair service and referrals to "local" authorized Coleman repair centers. Fogas AB (Sweden). Per Neil: "THE major supplier of all things Swedish. They have a lot of old pressure lighting spares that they do not list, but if you email them with part numbers they can often supply some pretty old and useful stuff for Primus Optimus and Radius pressure lamps. They are running out of some of the parts. They no longer take credit cards via email." Fred Kuntz (Cleveland area, Ohio, USA). Fred makes reproduction of obsolete mica and Pyrex Coleman lantern globes. Lehmans (Kidron, Ohio, USA). Flat and round wick lamps and parts. Coleman, Leacock, Petromax. Maidstone Angling Centre (England). Coleman, Tilley, Vapalux, Bialaddin, Anchor, Relum, Hipolito, Petromax. J. Moncrieff (Scotland). Glass manufacturer. Oil lamp glass and Tilley globes. Reproduction Tilley opal shades. Some lamp parts. Old Coleman Parts.com . Mike Merz has taken over from Bob Hitchcock in the spring of 2011, and has moved all the stock to his location in Vancouver, WA. PARTS! PARTS! T. W. Sands and Co. (Melbourne, Australia). Established 1918. All types of lighting - lampmaker, restoration & repair services a specialty. Extensive range of parts, including glass, for Aladdin pressure, Coleman, Tilley, plus a wide range of others. Web site: Sands & Co.
same e-mail as T.W. Sands. Stuga-Cabana Internet Shop (Germany). The largest Petromax dealer in Europe (plus other pressure brands, and even wick-fed lighting.) Also has a very popular Forum as a part of the site (in German). Tilley International PLC (England). All modern Tilley parts. On line ordering! Aladdin Mantle Lamp Company (Clarksville, TN) The manufacturer of the original Aladdin mantle lamp. The company website shows all the models available, as well as parts and accessories. The website has manuals for old models as well as the Enjoyment Guide. Also of interest on the site is a company history. Associated Kerosene & Oil Lamps (Brooklyn, New South Wales, Australia). John & Linda Gannon sell parts for Aladdins and other wick lamps, and do some restoration work. 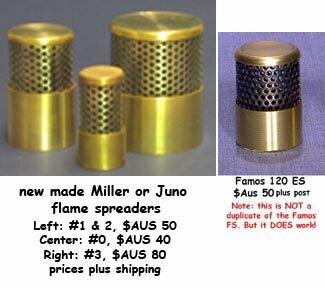 See note under New Made Flame spreaders at page bottom! Good Pickin's (Texas) Long time Aladdin Lamp dealers with a large selection. They carry a supply of Aladdin lamps, shades and parts. Jack's Country Store (Ocean Park, WA) A very interesting physical store that also provides Internet shopping. They carry a large supply of Aladdin lamps and parts. A cross reference for parts is available. W T Kirkman Lanterns Inc. (Ramona, California, USA). Tubular, dead flame lanterns, glass and parts, also new Kosmos lamps. Dietz, and parts for other vintage brands. Now carrying Aladdin lamps and parts. AB Karlskrona Lampfabrik (Karlskrona, Sweden). This company has been making lighting products for 120 years. They offer a line of Kosmos burners, with appropriate wicks and chimneys. They have a small list of retailers in Europe, but they seem to take orders from their website (available in several languages; the link below is to the English version). Kevin Holmes, Lampmaker (Emerald, Victoria, Australia). Kevin is an accomplished metalsmith who does restoration and produces limited runs of interpretations of old kerosene lamps. E-mail: Kevin Holmes e-mail Note: Kevin's e-mail is a small pocket device which will only receive text. He is likely best contacted by mail. Lumiere de L'Oeil (Paris, France). M. Ara has a lamp shop, and specializes in European gas lighting and liquid fueled lamps. He offers repair and restoration, including many lamp accessories like beaded fringe. T. W. Sands and Co. (Melbourne, Australia). Established 1918. All types of lighting - lampmaker; restoration and repair service a specialty. Extensive range of parts, including glass (can be custom made), for Aladdin, Miller, wide range of others. Scott Seymour & Sons (High River, Alberta, Canada). Scotty specializes in repair and restoration of center draft and flat wick lamps and their associated parts. Re-casting of parts and fittings. All types of wicks. Miles Stair's Wick (and Chimney) Shop Miles is a lamp collector with a passion for getting lamps operating. Frustrated with the lack of current replacements available for the old "consumables", he has contracted with several well-known makers for smaller runs of wicks and chimneys specifically made to fit a variety of lamps. As these aren't "commercial runs", the prices may seem high, but all the products meet original specs (size, thickness, diameter, density, etc. ), and as order quantities increase, over time prices will come down. Note the web site is Mile's complete site, commercial and collection. Use the index to get to wicks and chimneys. The Wooden Shoe (Charles Town, West Virginia, USA). Jim and Shari VanEs have a retail shop selling lighting, furniture and glassware, and provide a restoration service. Jim also has original parts for sale. For any changes to this list, or for Guild consideration of possible additional listings, please contact the Page Manager - Neil McRae . The people and companies listed above are individuals we know, and have used. The list is NOT an endorsement or guarantee.